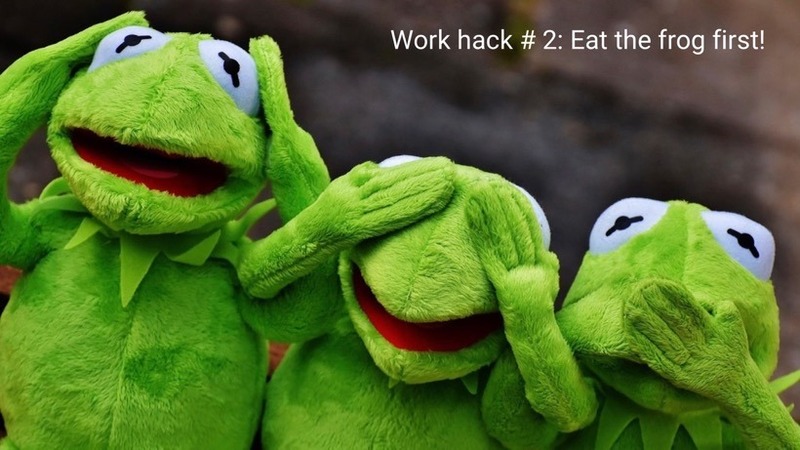 Work hack # 2: Eat the frog first! Work hacks are simple yet original methods that can be used quickly and directly to improve teamwork and work results. In our series, we present tried-and-tested work packages that sustainably change teamwork. Eat the frog first? This means that the most difficult and important task of the day is done first. Often, you start the day with e-mails or other smaller tasks. After that, it is usually difficult to undertake a more complex task. Everyone probably has one (or more) such task on their to-do list: an unpleasant phone call, a complicated presentation, or a difficult project. People tend to postpone such difficult and/or time-consuming tasks again and again. However, these tasks always remains in the back of your mind. So: Eat the frog first! The day before, write down your “frog” task and put it on your desk. Start with the “frog” in the morning! After that, you’ll feel relieved and proud. Your head will be free again and you can energetically start the rest of the day. “Eating the frog first” is therefore perfect for a productive start to the day. Extra tip: What’s the most important task? It’s important to identify the frog exactly. It does not always have to be the most urgent task. If the frog is too big, you can break it down into smaller to-dos. https://www.tandemploy.com/en/wp-content/uploads/sites/3/2019/02/Eatthefrog-1.jpg 461 820 Alicia Metz https://www.tandemploy.com/en/wp-content/uploads/sites/3/2018/02/Tandemploy_Logo_en.png Alicia Metz2019-02-12 09:25:252019-02-12 09:25:25Work hack # 2: Eat the frog first! Work hacks – Working smarter Found a tandem partner? Here’s what to do next!